In this design, neither colour is seen as the background. In some parts one colour is obvious; in other parts the other colour can be seen. When the piece is looked at from directly in front the two colours are seen as horizontal stripes. The Fibonacci Sequence is 1, 1, 2, 3, 5, 8, 13, 21 ... 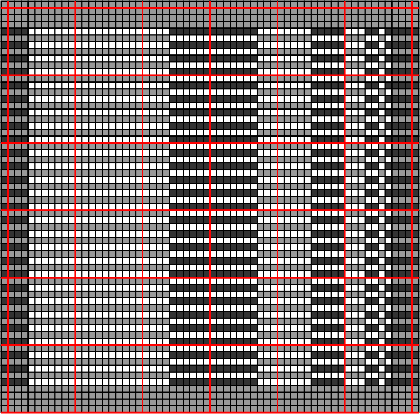 It would be difficult to represent this accurately on the illusion as the single stitches at the edge would not be clearly seen. To avoid this the piece was given a 4-stitch border at each side. 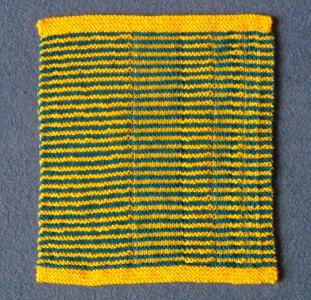 It also has a 4-ridge border, in yellow, at top and bottom. Using Light, cast on 62 stitches. This counts as the first row of the first ridge. Ridge 1 - Second row: Knit. Ridge 2 (Light) : Knit both rows. Ridges 3 and 4 : As Ridge 2. Ridge 5 (Dark) : Knit the first row. 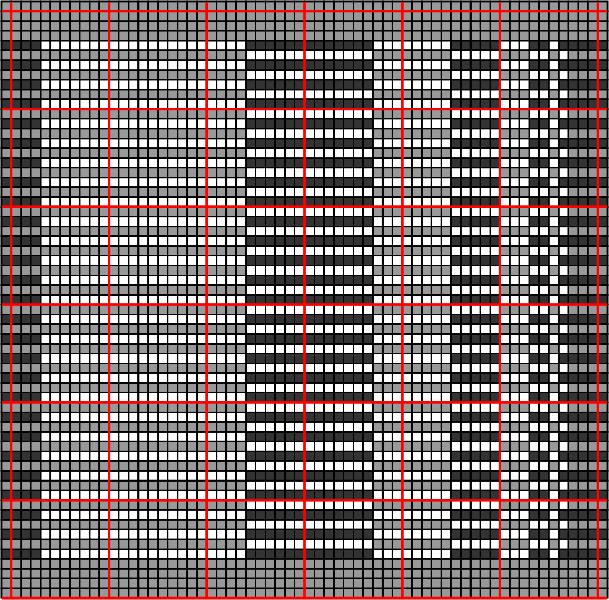 For the second row follow the chart, from left to right, knitting dark grey stitches and purling white stitches. 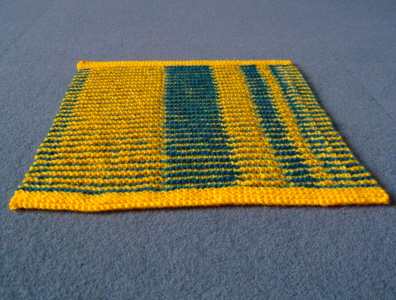 Ridge 6 (Light) : Knit the first row. For the second row follow the chart, from left to right, knitting light grey stitches and purling white stitches. Repeat Ridges 3 and 4 until you reach Ridge 57 on the chart, ending on a dark ridge. Ridges 58 -61 (Light) : As Ridge 2, casting off on the last row.